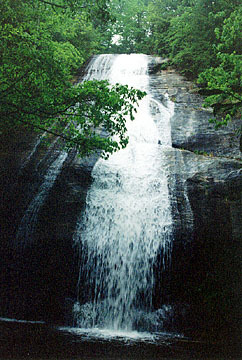 Hilliard Falls aka Bear Camp Creek Falls was renamed in honor of Glenn Hilliard, one of the founders of the Foothills Trail Conference and its first chairman. 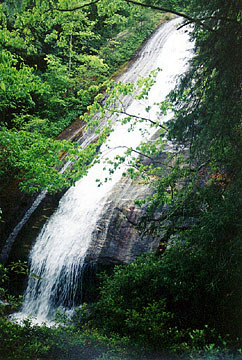 The 50-foot high falls are accessible via a .2-mile spur trail off the Foothills Trail in the section between the Thompson and Horsepasture Rivers. 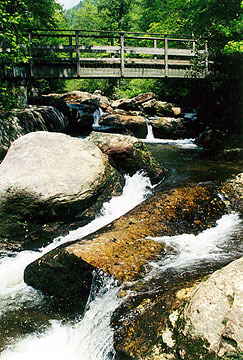 Via the Foothills Trail, the falls are about 5.5 miles from the Bad Creek trailhead and about 3.5 from the Horsepasture River crossing over the backwaters of Lake Jocassee. The falls are about one mile from the official Bear Camp Creek camping area. Directions: From Walhalla, SC, drive SC 11 east past Tamassee, SC to Salem, SC at the intersection of SC 11 and SC 130. Look for signs directing you to Whitewater Falls. From that intersection, turn left and drive 10 miles up SC 130 to the Duke Power Bad Creek Project. Turn right, drive up to the gate and wait for it to open. From 6 a.m. to 6 p.m., the gate should open automatically to let folks in. 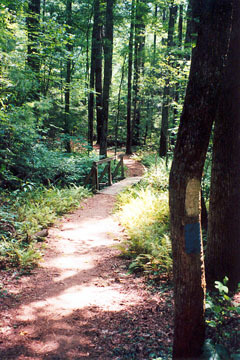 (Hikers can get out at anytime, but folks can only get in during daylight hours.) Drive another two miles down to the Foothills Trail trailhead parking lot. 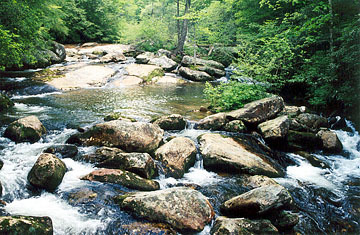 From Sapphire, NC, drive NC 281 past the Upper Whitewater Falls overlook area to the stateline where NC 281 become SC 130. Follow SC 130 another mile or so to the Duke Power Bad Creek Project on the left. You can also reach SC 130 from SC 107 via SC 413 near the SC-NC state line. Again, look for signs directing you to Whitewater Falls. Portajohns and pay phones are at the trailhead. Hike the blue-blazed access trail to the Whitewater River. Cross on the two bridges and join with the white-blazed Foothills Trail. 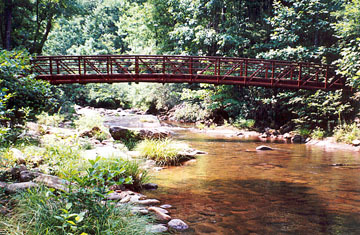 Hike the Foothills Trail approximately 5 miles to the falls. This hike makes an excellent weekend backpacking trip because you can also visit Lower Whitewater Falls and you get to cross the Thompson River as well.